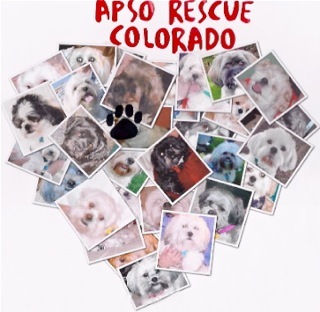 All of these beautiful apsos have passed through Vickie’s big heart at Apso Rescue Colorado and found loving homes. Many of the dogs were abandoned, abused, and neglected or sadly surrendered due to an owner’s illness or death. The dogs come in all “flavors”, age–even puppies, or wise, old monks with whiskers destined to melt your heart. Read more about the work of Apso Rescue Colorado at (http://apsorescuecolorado.wordpress.com/) and consider offering your support!